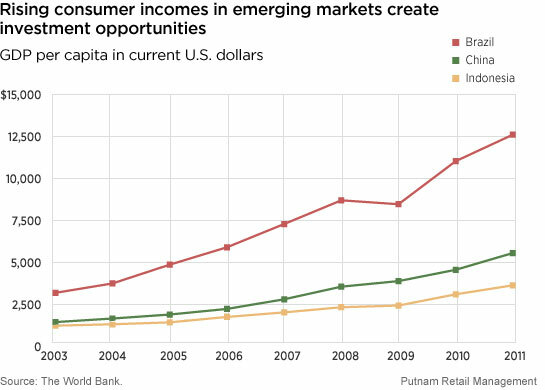 In emerging markets, the growing strength of the domestic consumer is a powerful long-term investment theme that may benefit a variety of global companies. But while the emerging-market consumer is generally healthy, there is regional and country differentiation that is worth noting. In Brazil, the average income is above $10,000 per year, whereas in China and Indonesia, average incomes are in the $2,000 to $5,000 range. As Brazilian incomes grow — say from $10,000 to $20,000 per year — Brazilian consumers are more likely to buy bigger-ticket items, such as cars, houses, or major appliances. As incomes grow in China or Indonesia, by contrast, from $2,000 to $4,000, consumers are more likely to spend additional money on smaller-ticket items, including personal-care products and food. So while we expect incomes in all of these countries to continue to grow, we think it is important to understand where the real-dollar growth is likely to occur, as that will have implications for the companies that supply emerging-market consumers with a variety of goods and raw materials.